Fiberglass inspection, repair and lining company responds to increased demand by adding additional FRP tank trailer service capacity. American Fiberglass Tank Repair (AFTR) has announced that it has equipped and commissioned an additional trailer lining facility at Mercantile Place in Franklin, NH. The new facility will immediately double AFTR’s dedicated trailer lining capacity. The new facility also offers additional inside space for future expansion. AFTR’s existing fiberglass reinforced plastic (FRP) tank trailer lining facility is located in Ashland, NH. When finished, the Mercantile Place business complex will be home to a mix of additional businesses, including FBG Tank Services, a branch of First Business Group; Sustainable Refining, a formulator of “Green” vehicle undercoating products; Poly Lining Systems; Online Motor Deals, LLC; and a vehicle service maintenance center. The complex will be managed by GP Property Management, a division of General Properties, LLC. 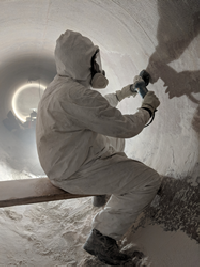 In addition to its NH based FRP tanker trailer lining business, American Fiberglass Tank Repair, LLC, also provides strategized services using regional technicians for its field service teams. Serving all of North America and focusing on the needs of the potable and wastewater industries as well as chemical processing operations, these fiberglass field service teams consist of specialists in the repair of fiberglass nozzles, tank leaks, shell cracks, as well as internal corrosion coat restoration, on all fiberglass vessels. Engineer-driven, the AFTR field service teams are seasoned technicians trained by the composites engineers who head up the AFTR operation. AFTR field crews are equipped to supply repairs and services to fiberglass vessels in all 50 U.S. States, Canada, Mexico and the Caribbean.